The Islands Flores and Komodo, with Komodo National Park, are known for being world class SCUBA dive destinations. Plus, Komodo is known as the land of the dragon referring to the Komodo dragon (Varanus komodoensis). Together with friends from The Netherlands we flew from Bali to Flores (East of Bali) for 8 days of diving and exploring the wildlife. The initial plan was to fly to Maumere Airport and drive slowly to Labuan Bajo as a road-trip but we found out the roads are horrible and it would take us days of bumpy rides just to make it to the other side. We booked a return ticket to Labuan Bajo and would go from there. Once arriving by airplane the landscape changed from mountains and jungle forest to hills without trees, like a steppe climate, with crystal clear waters! Labuan Bajo is a harbor town focusing on fishing and tourism. Jalan Soekarno Hatta is the 'mainstreet'. The tours are mainly about SCUBA diving and visiting the dragons. There are shops and signs everywhere with their offers for 'tomorrow'. In between there are bars and restaurants, souvenirs shops and quite a lot of 'more local' shops like mobile phone and groceries stores. With 8 days to explore the west-coast of Flores we wanted to rent a scooter in Labuan Bajo to explore the area. We walked into town and asked around, but there where not a lot of scooters available. The starting price for a day was 150.000 Rupiah but we needed to wait until other people had returned theirs. Once we got hold of a scooter we started driving around the airport and we went off the asphalt (Jalan Trans Flores) to start a bumpy road trip across rivers towards the viewing point of the Nisa Saloka island. The first thing that surprised me: The roads on Google Maps were outdated. Many times we had to return due to dead-ends but it was a great adventure! Road-trip around Labuan Bajo on a scooter. This trip was about 30 KM long, it takes about 2 hours one way. After driving half of the tour we had our first flat tire, without realizing it. Luckily we stopped right in front of a mechanic and they started laughing and pointing at our tire. They fixed the bike and the whole village came to watch and laugh with us, it was great! On our return we had another flat tire, luckily we were almost back on the main road and somebody gave us a ride with his scooter. Flat tires in the middle of a local village. Cunca Rami Waterfall is another place to visit with a scooter. It takes about one hour to drive there, 35 KM. This place is easier to reach since you stay on the main road, Jalan Trans Flores, most of the time. The last part up to the waterfall you need to walk. Do not worry about finding a guide, he will find you as soon as you are in the area. Be careful when climbing the waterfall, it can be really slippery and there are no safety barriers. Have a refreshing swim! Komodo is called the land of the dragon, referring to the Komodo Dragon (Varanus komodoensis). These living fossils can get about 3 meters long. They are only 'available' on Rinca and Komodo Island in the Komodo National Park where they roam free. 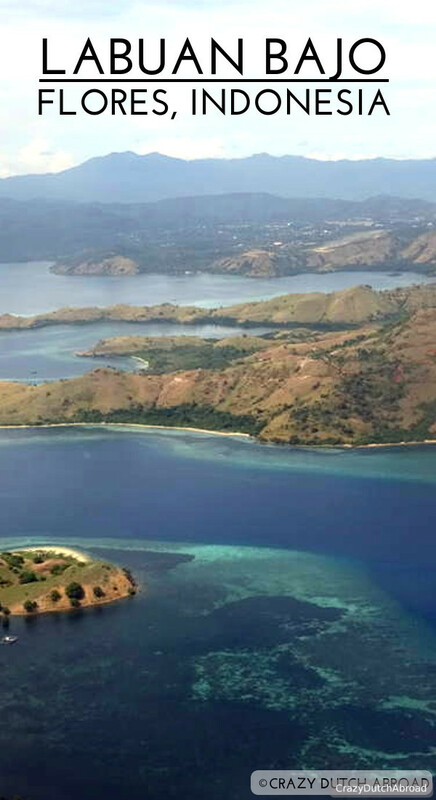 Click here to read about visiting the Komodo National Park! SCUBA Diving in Komodo National Park! SCUBA diving around Komodo in Indonesia is on many divers wish list as it is known for world class diving. Should you go on a liveaboard or do day-trips here? What are the best dive sites? Dive center recommendation and more! Click here for information about SCUBA diving in this area! Since there is not a lot to do around town, we tried a lot of bars and restaurants. Here are the recommendations. If you like eating local and cheap, visit the fish market on Jalan Soekarno Hatta. You can buy a Bintang beer across the street in one of the supermarkets to accompany your dinner. This is not a fancy place. As with most local Asian restaurants it is bright lighted, not so clean and you will sit on plastic chairs while eating from plastic plates, but the food is fantastic! Fish market (navigate to Pantai Kampung Ujung). Try the grilled squid! The opposite is Atlantis Beach Club. It is posh, fancy and quite expensive but the views are amazing and there is a swimming pool you can use. They offer Indonesian (Western-adopted taste) and Western food. If you go for happy hour your get 5 beers for the price of 3, make sure to mention 'happy hour' when ordering... They also offer a free pick-up and drop-off service. Ps. If you arrive by boat and it is low tide, you have to walk quite far through the sticky mud. If you do not have an accommodation and you want so swim in a pool, spend some money at Blue Marlin Dive Komodo! When we were here Happy Banana was #1 on TripAdvisor, and I loved it. You can sit in the air-conditioned area inside or dine outside by the candle light. The menu is not cheap but has a lot of fresh ingredients and the taste is good! I really loved the sushi, made from local caught fish. The staff is very friendly. There are many Italian restaurants in town. We tried a few and this is our favorite. The prices are 'average' for the cozy restaurants in town and the ambiance is great! Look at the presentation of the food! If you care for a glass of wine, La Cucina is cheaper, about 55.000 Rupiah for a glass. Around town they sometimes ask 150.000 Rupiah for a glass of wine - make sure to check the prices! Compared to Bali the accommodations are expensive around here and you get way less. When looking for a place within our budget it was either with a swimming pool on the 'wrong' side of the airport or without a pool. I made the mistake of thinking that one block away from the main street (Jl. Soekarno Hatta) would be still downtown and easy to walk. We stayed in CF Komodo which is about 1 KM from the airport en 1 KM from Jl. Soekarno Hatta. The only thing was that it was right on top of a hill. The views were amazing but during the middle of the day or after a day of diving, I would prefer a shorter and less inclined walk. This was still OK but the hotel was building a new apartment complex and the rooms were really basic. The bathroom was outside with the butan gass tank right in the shower, the water pressure was low. There was one big light in the room and one power plug. No WIFI and over our local SIMS the connection was bad as well. It is more like a home-stay and the staff/family was really friendly but not helpful in things like scooter rental, taxi ordering, finding laundry service. After a few days we decided to upgrade to another hotel, with a swimming pool and more comfortable rooms. We visited a few and Laprima fitted without being too far out of town (but not walking distance). They offer a shuttle service for 50.000 Rupiah one-way to and from town, up to 10 PM. Airport returns are free. Customer service was not really standard but a few staff member were sincerely friendly and helpful. The location was beautiful, amazing sunsets, and the pool was great. The only downside we encountered was the Food & Beverage. The prices were high (as to be expected) but the quality did not match at all. We rented one of their scooters (50.000 half day) to have lunch and dinner at one of the local warungs. (Try Warung Warung before the one-way-street starts). Having that said, I am positive this is one of the best places to stay in town at the moment. The town is developing.